For a game that seemed so simple when I first learned of it, I’m finding myself continually surprised by how many different ways there are to look at Karuta. It almost acts as a mirror held up to each character, revealing their true nature to the audience – and eventually, one assumes, to themselves. 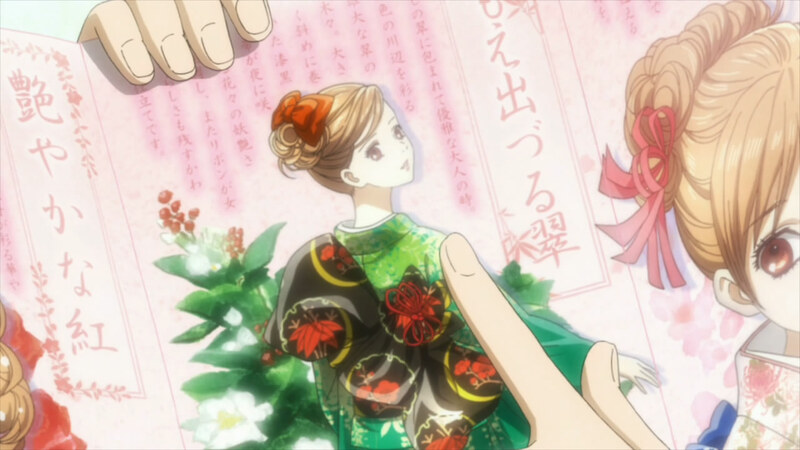 As mentioned last week, each cast member has shown their own viewpoint about Karuta and how to attack the game. This week we saw that demonstrated in pretty graphic form. 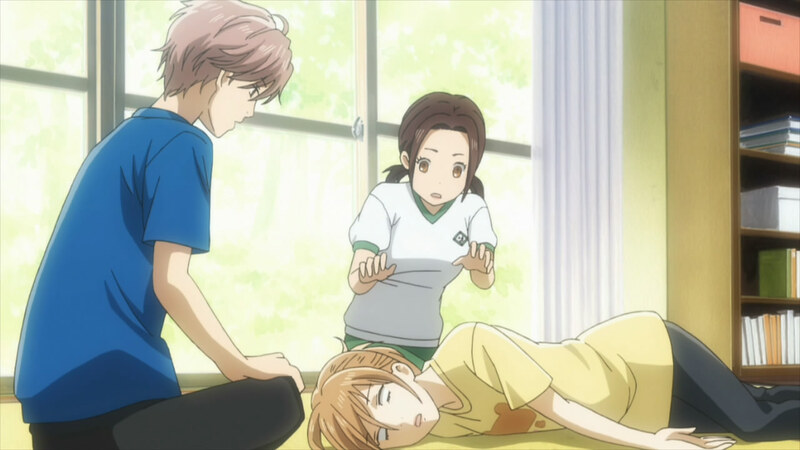 Taichi’s analytical skills are undeniable, but they’re no match for Chihaya’s raw talent – she simply reacts more quickly and uses all that track training to her advantage. 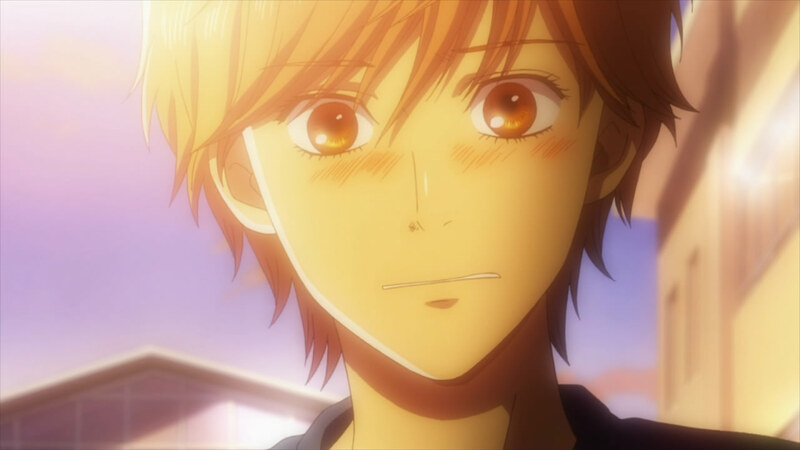 It’s been easy to forget in all the focus on Chihaya, but Taichi is a pretty competitive guy, and I was wondering how long it would take before constantly losing – even to the girl he loves – would become unbearable for him. At first, all he can think of is whether his weakness is holding her back from becoming a better player, and whether that would be different if Arata were around. The catalyst for change comes in the form of Tsutomu Komano (Yonaga Tsubasa), the next target Chihaya has in mind for her quest to get the club to the requisite five-member level needed for survival. Tsutomo is pretty much your classic bookish nerd, one who takes the old saw “attached to his desk” quite literally. 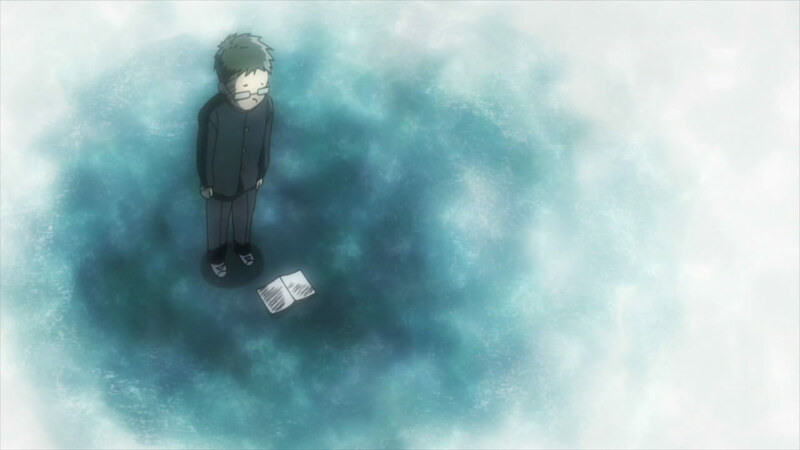 He’s disdained by his classmates who call him “Desktomu” and isolate him socially, though they’re only too happy to see his test scores improve their class rank and to copy his notes. If Arata is Taichi’s “white whale”, the opponent he can never measure up to, Taichi is himself that person for Tsutomu. Never mind the fact that he studies harder, Tsutomu can never pass Taichi in the class rankings – and Taichi has the gall to be good-looking and popular, too. 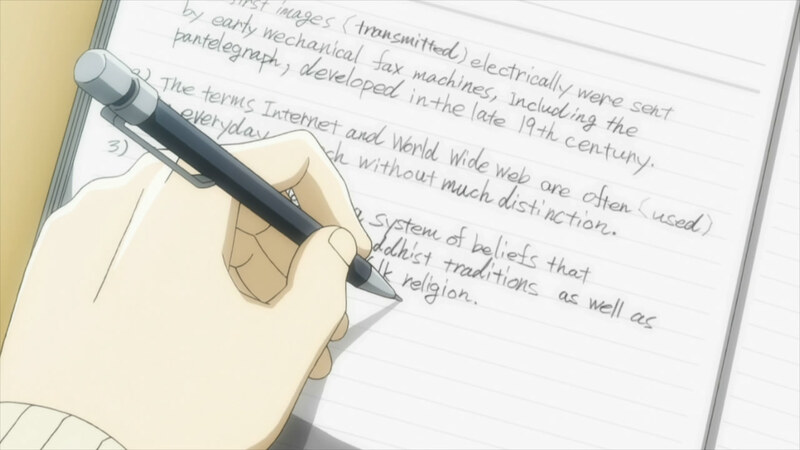 For all this, Desktomu envies and despises Taichi. The irony, of course, is that Tsutomu has no idea that Taichi is just as unhappy as he is. 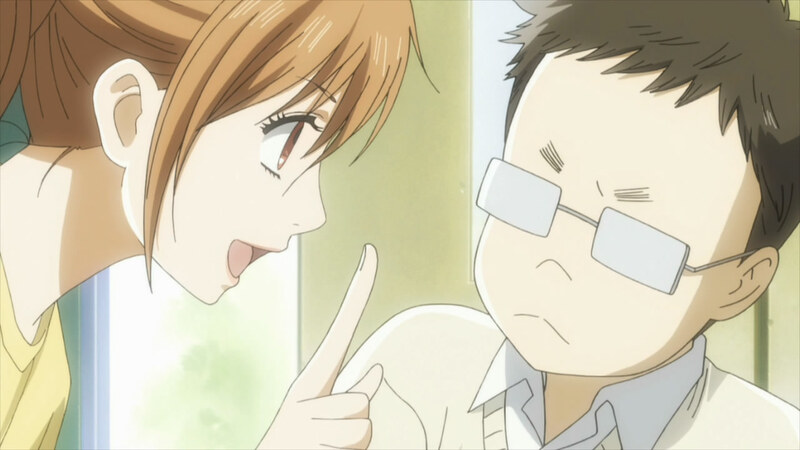 But the real action comes when Chihaya drags him, desk and all, to the clubroom and tries to persuade him that Karuta can help his memorization skills and thus his class rank. He dismissively challenges her to prove it by playing the game with the cards flipped upside-down. If the result is an “a-ha” moment for Tsutomu, it’s a genuine epiphany for Taichi. In this new challenge (not dissimilar to the “Blind Go” Akira was challenged to by his jealous clubmates in Hikaru no Go) his eidetic memory and analytical prowess give him the upper hand over Chihaya. Not only does he soundly defeat her, but finds that he enjoys it a lot, and finally admits the truth to himself – he hates to lose. 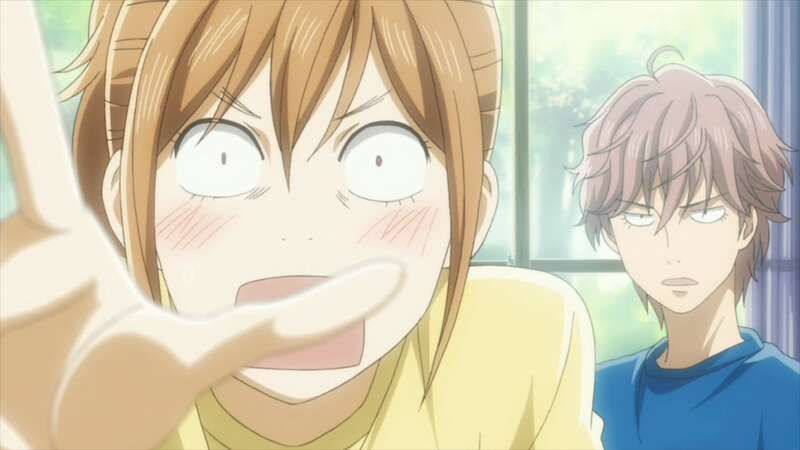 The key moment of the episode was Taichi’s triumphant “Chihaya – I’m the one right across from you!” – but of course, he didn’t say it aloud. 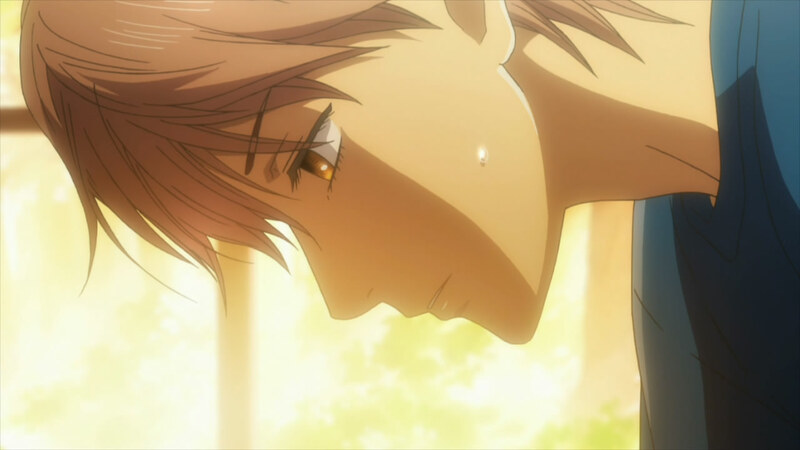 It’s not easy competing against a memory, but that’s the reality of Taichi’s challenge if he wants to win Chihaya for himself. As many driven, successful kids are, he’s obviously lacking in self-confidence, something this newfound taste of glory will hopefully help him overcome. 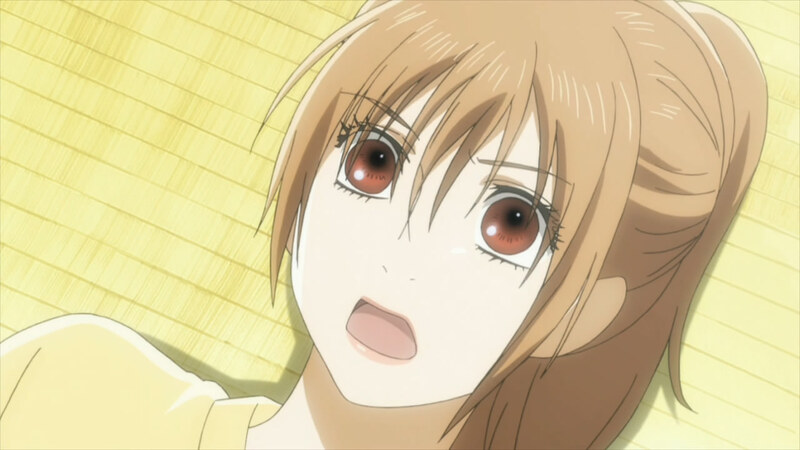 The math for Chihaya is simpler – she was dominating, and now she lost. For her it’s a matter of doing what she always does, taking on a new challenge and figuring out a way to beat it. 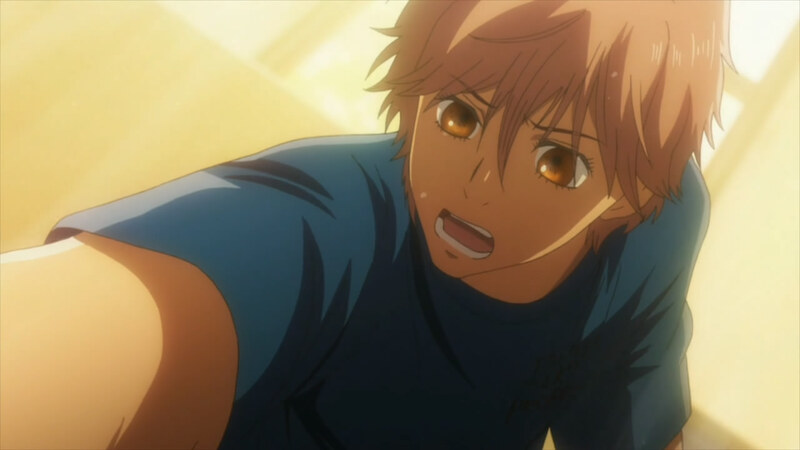 But for Taichi it’s everything – not just the chance to win a game but to finally be useful to Chihaya and feel good about himself for something that actually matters to him. As for Tsutomu, his introduction wasn’t as compelling as that of Kanade, if for no other reason than that we didn’t get nearly as much backstory in his case. But his character has a lot of potential, given that at the moment he seems to be a totally unexpressed person. 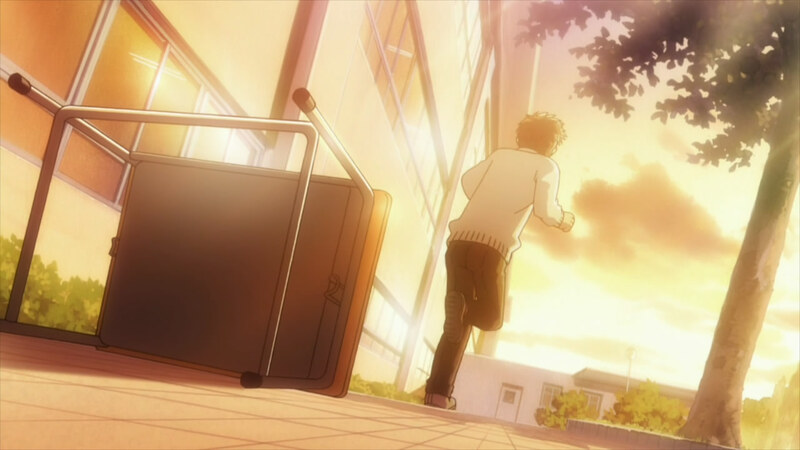 Karuta will likely provide him with the opportunity to forge an identity beyond the caricature his classmates have imposed on him, one that he seems to have largely bought into himself. It’ll be interesting to see what approach he takes to the sport, given that he’s lacking the left-brain dexterity of Taichi, the physical talent of Chihaya or Kanade’s passion for the game itself. Will he find a way to make his grinder mentality work for him on the tatami, or will he adapt and change to find a way to compete? We’re four down and one to go as far as club members, so I expect that part of the story to warp up fairly soon. I also don’t think we’ll see Arata for a while, so the next big thing I’m really looking for is some deeper exploration of Chihaya. She’s been a vastly entertaining character, passionate, beautiful and full of endearing and very odd quirks. She’s a great physical comedienne, too. But we haven’t gotten into her head much, really – rather, we’ve mostly watched her from a slight distance as she wears her passions on her sleeve. 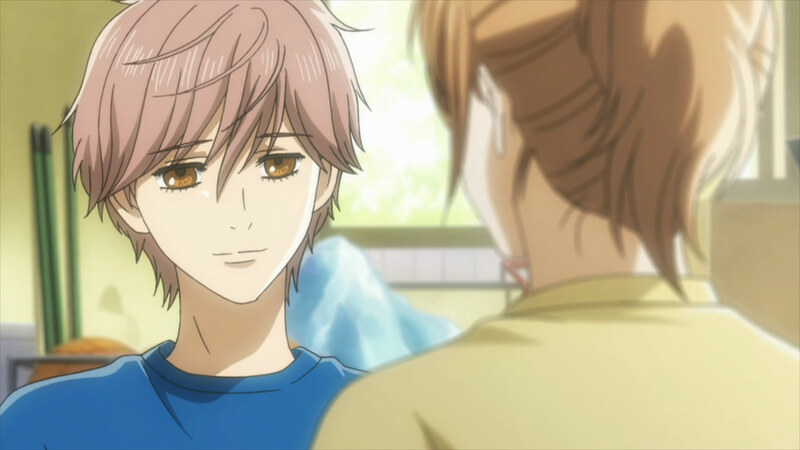 It’s Chihaya who’s driven the narrative, but in some ways it’s Taichi who’s been the POV character – we’ve spent much more time inside his thoughts and come to understand his insecurities and desires in a much more profound way than we have with Chihaya (or Arata, for that matter). I wonder if that understanding might come from a deeper exploration of Chihaya’s relationship with her sister, as I think it’s a bit early for major developments on the romantic front. I think it’s possible that she’ll always be mostly a sort of force of nature as seen through Taichi’s eyes, and something of a mystery. The series has been great so far while operating using that approach so I won’t complain if that’s the case. While this is probably my favourite show of the season, along with Boku wa, I have to admit that I didn’t find this episode as engaging as the previous episodes. 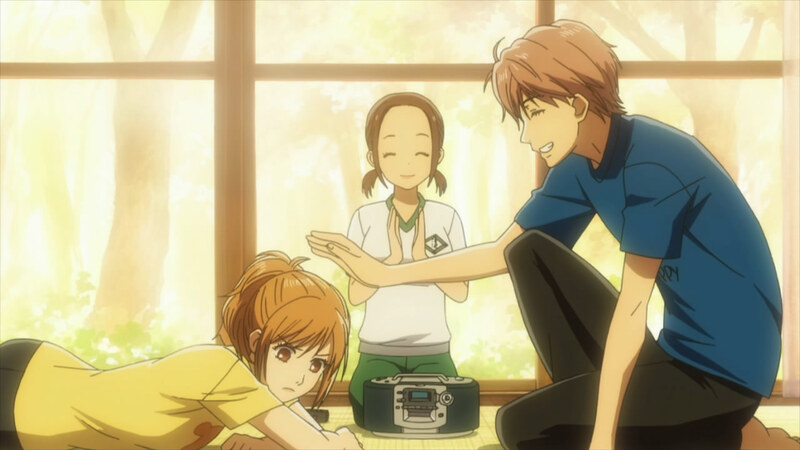 Some of the outcomes were interesting, specifically Taichi’s gaining of a new perspective that is actually his own, but other than Chihaya introducing Desktomu to the club and Taichi’s mental development, the show felt light. 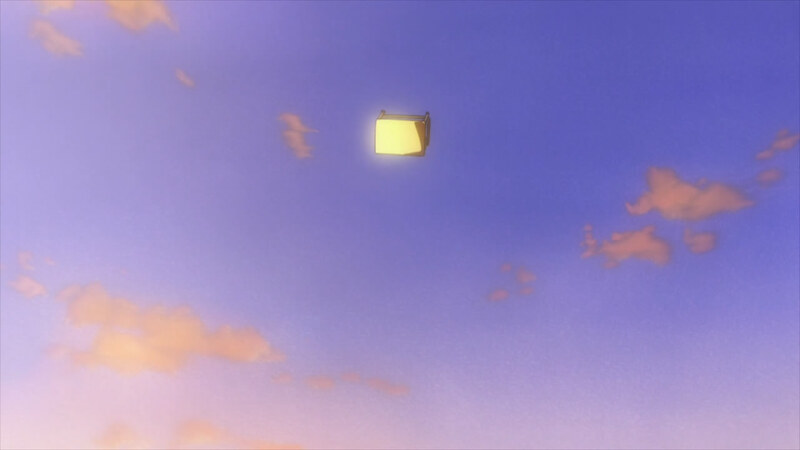 I guess that Desktomu is still a caricature, despite the amount of screen time he got. While Kanade has joined the club, she isn’t really playing yet, or doing much of anything for that matter. Hopefully, next week will come with some forward progress. I think one of the questions that will soon be answered is how the club will interact with each other. It feels like we have a personality imbalance with the “real” people trio vs the so far 1D club members. The member last week didn’t show any real personality, I can’t even remember what she said or did. I don’t even remember what desk-kun and traditional/classical archery girl’s names are. I absolutely love this SOL! The shows’ creators are pacing this wonderfully. No regurgitating cliched tropes so far. With this episode versus the introduction of Kanade, we see a lot more character development for both Taichi and Tsutomu. Personally, I find this episode a lot more relatable to myself and a lot less confusing than the Kanade episode (at least for myself). 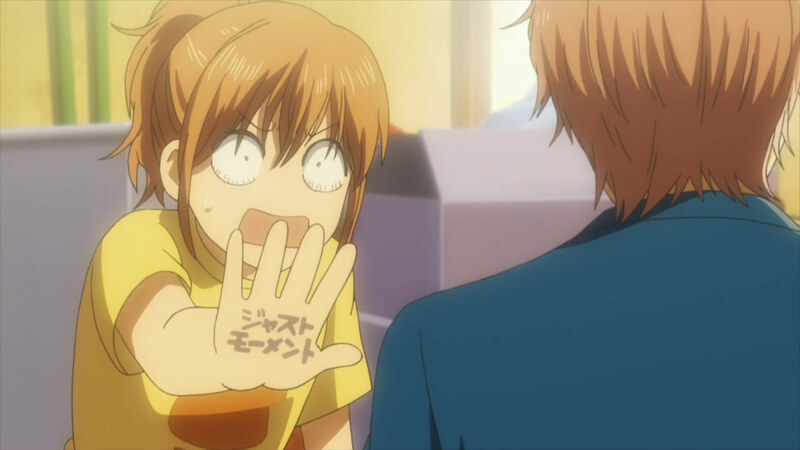 Wow, Chihaya is a monster. She picked up and dragged kid and a desk half way across the school. 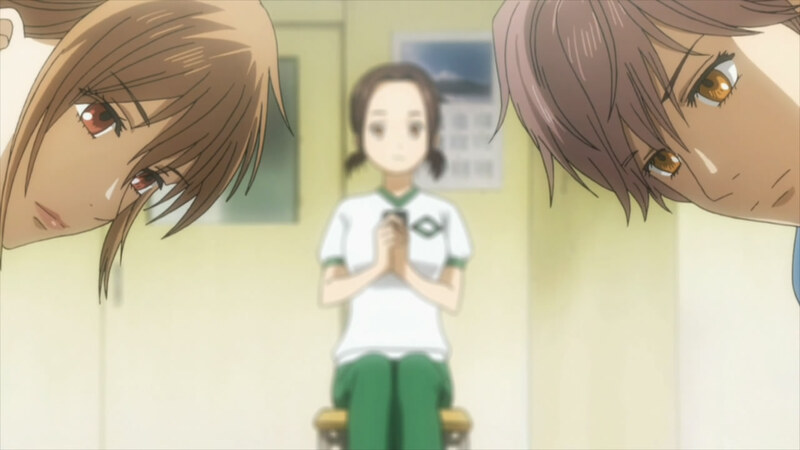 Also I guess we know now, as Taichi predicted, that she really doesn’t memorize the position of the cards. This is great! The history lesson last week added so much color to a game I viewed as any othe rcard game and now we have Komano that brings another level of strategy to the game. 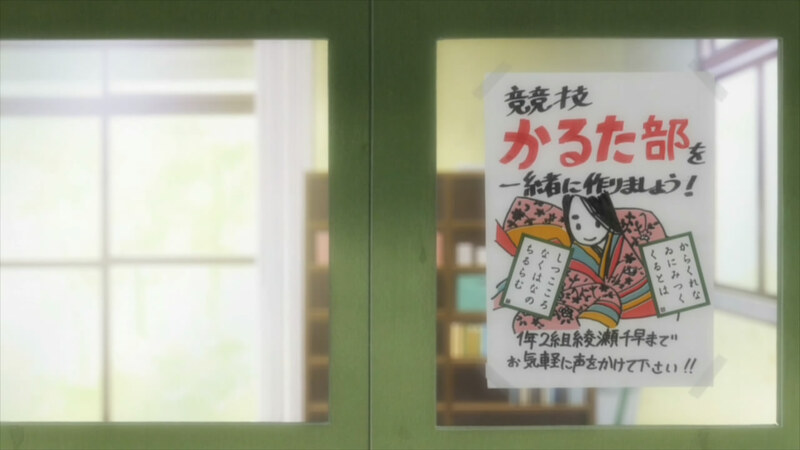 I imagine if they play this style it will really pave the road to being an elite Karuta club. If you think about it I guess a huge amount of thought goes into being the best and developing the advanced technique that gives a competitor the real edge to become an all around champion, not just someone who relies on a honed aspect of their game. 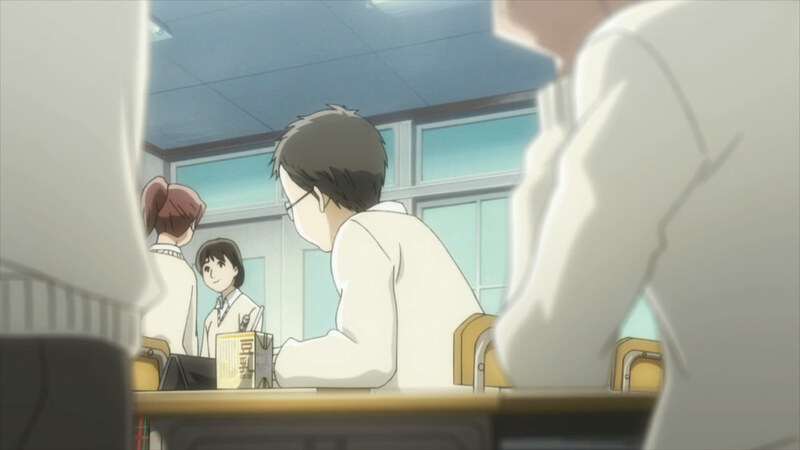 It’s pretty exciting to see how everything is building Chihaya’s talents into skills. Well done writers. 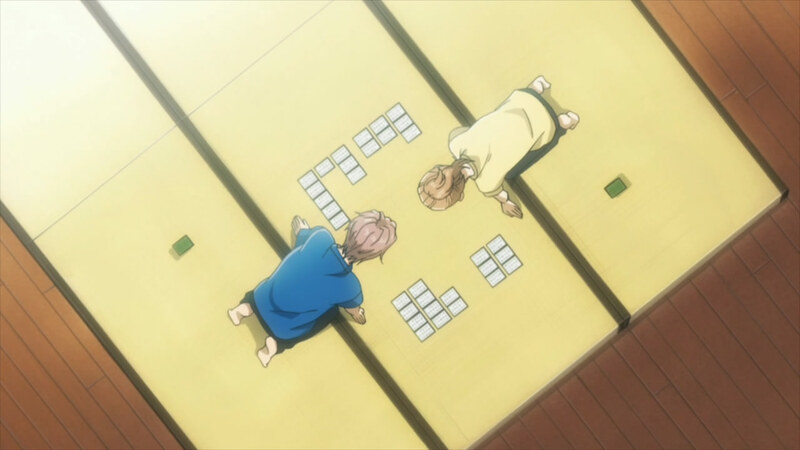 The blind karuta actually reminded me more of “Hikaru no Go” when Hikaru played Kurita Pro in one color go. The Kurata game was less similar to me, because in the blind go Akira had to remember the position of every piece without looking, even after they were moved. But the basic idea is the same – and both of them were good training tools, just as this exercise is a good training tool for Chihaya. If you’re finding something too easy, make it harder – you have to challenge yourself all the time if you want to compete seriously. The thing about the Akira’s blind game was that his opponents were not blinded and Akira had to use his genius prowess to almost defeat 2 of 3 of them. 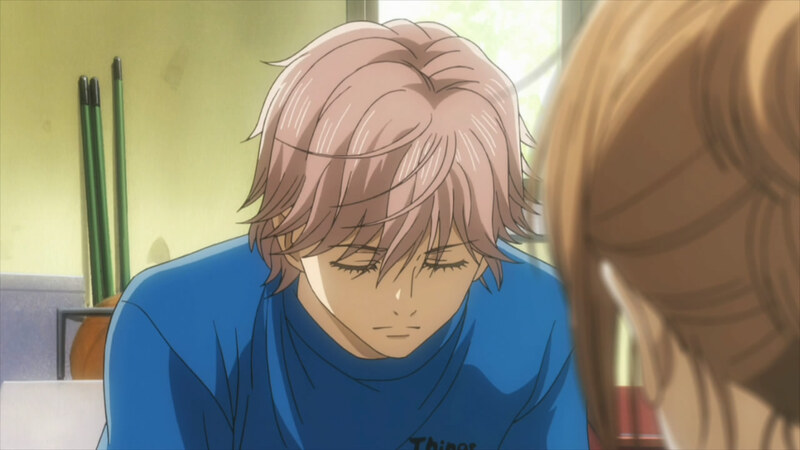 I don’t think that parallels this blind karuta game where both players were blinded and the non-genius/talented Taichi actually has the upper hand. That is why I think the one color go game was more similar. and what’s written on her hand here? 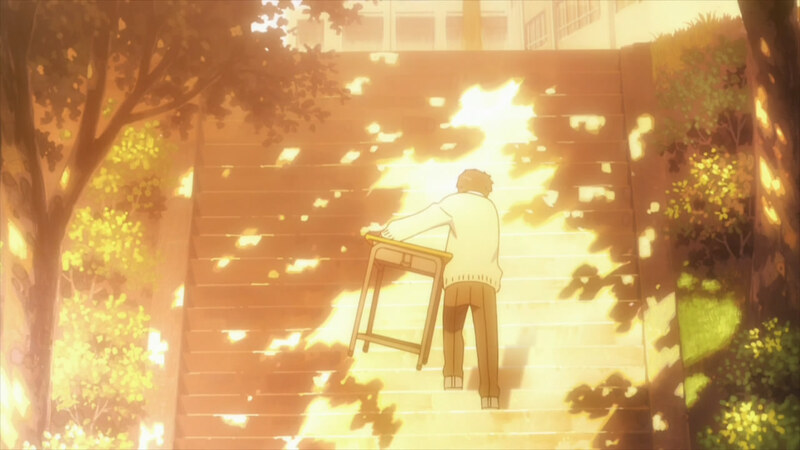 @Enzo: so no screen cap of Chihaya carrying both tsutomu AND his desk? Why are all of the comments being voted down for no reason whatsoever? Just this once, I’ll play along… There you go, see above. This episode felt more like a Taichi episode than an introduction episode for a new character. We got to see more about his point of view and learn more about his strong traits as a Karuta player. 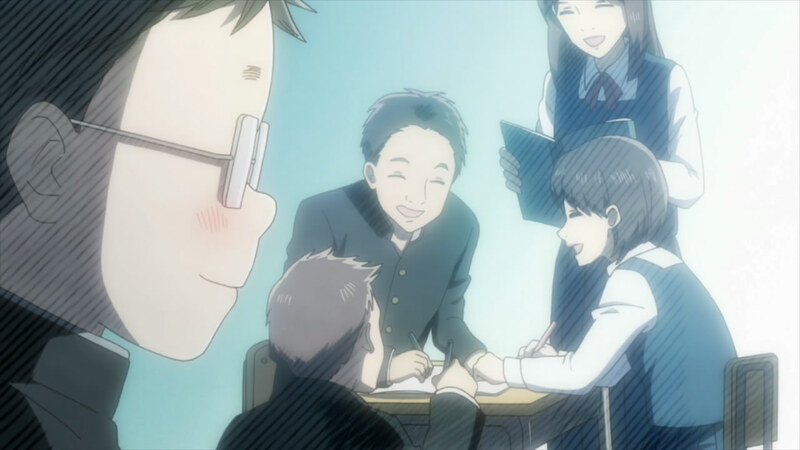 I think that the roles at the end of the episode, in the part when Taichi tells Tsutomu that he tries hard even against the odds, should be reversed: Tsutomu should be the one telling Taichi about how hard he tries, because, honestly, from what we have seem so far, Tsutomu is just an uglier, less intelligent, less talented, less social version of Taichi! I look forward to see how Tsutomu will be developed. 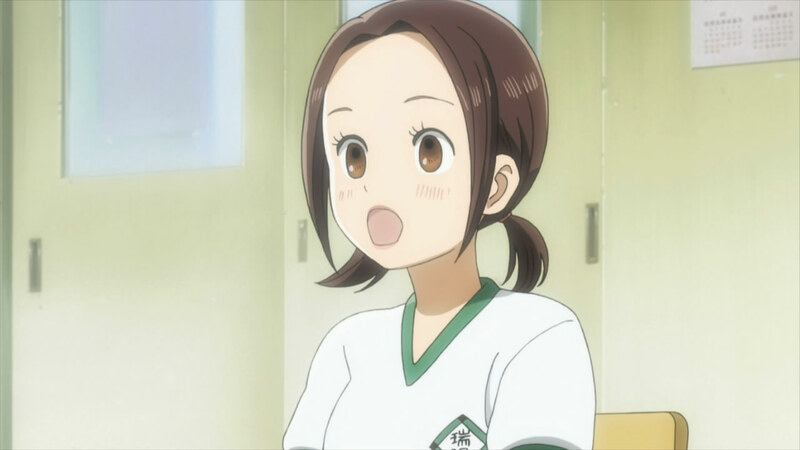 She’s a dime a dozen among anime characters, meaning someone like her would be a dime a dozen in real life also. In general, thumbs up-thumbs down rating systems are prime tools for trolling people. It’s a bit more controlled on this site but for the most part, it’s usually better to just have a thumbs up system. It’s more positive. True, but I think that the majority of the people who read the comments are the active readers of RC.. Trolls will show up in smaller numbers in comparison and thus be ignored. But really, we’ll just have to see won’t we? So far it seems to be fine. And it is more positive, but not everything in life is positive right? I think it’s okay to have a disagree. After all, constant sunny weather without rain only makes a desert. For me, it doesn’t have to do with trolling. I just think it’s weird to have ratings for comments, instead of articles. The article is what people are drawn to, and that’s what should be rated. You’re missing the point of the comment rating system then. 1.) It makes people accountable for what they say even with anonymity online. If you discuss things in a respectful and constructive manner like you would in real life, then you have nothing to worry about. 2.) It allows readers to moderate comments to a certain degree themselves, since everyone has the power to help hide comments that don’t add anything meaningful to the discussion. It can also be used to hide blatant spoilers. 3.) It provides lurkers with a means to simply show agreement/disagreement to what’s being said. Popular comments that warrant extra attention will be highlighted. Us writers are always the subject of ridicule — often personal — so I find it odd how people are getting a bit defensive about a system that isn’t intended to rate you as an individual, but simply what you said in one particular comment. I get enough unwarranted heat as is, so I’ll have to say no to a rating system for posts. Feel free to Like or +1 them though. So can you post an small news about how you actually want us to rate comments? Generally people can respectfully offer an opinion that you disagree with. Is this up or down or none. You don’t really need him to tell you how to rate do you? It’s pretty much commonsense. Given the situation you described personally I wouldn’t do either though it may vary depending on how much I actually disagree with the other person. Though in those situations I’m more likely to reply with a comment on why I disagree. I think thumbs down is only really deserving for comments that are rude, spoilerish or just plain stupid. It’s not like we have to rate every comment either so if you come across this “dilemma” then just don’t rate it. Generally, I’d just do it for the ones I feel most strongly about. I lol’d at the whole idea of ratings making a person accountable. That’s just ridiculous, Divine. My man Taichi! It’s about time he stopped losing in almost everything and started to win. Great development on Taichi’s front, and great man overall. Also the recruitment of new characters seem really natural. It’s not really unbelievable and the characters don’t join for lame reasons. I thought this during Kanade’s episode and this one only further supports it. 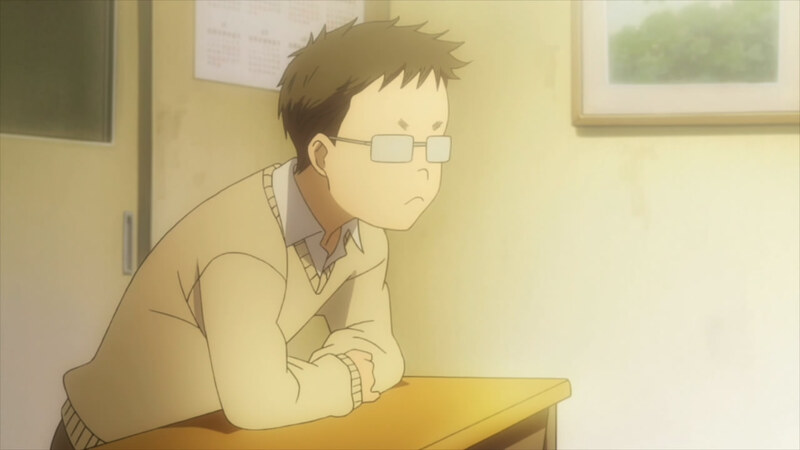 They turned his name Tsutomu into Tsukue-kun (Desk-kun). I can’t believe even Chihaya called him that. That is just plain disrespectful when you want to invite someone to join your club. Three to four years ago she was the kind of girl who stood up against people bullying people against everyone in her class. How exactly did she turn clueless enough to call people such insulting nicknames? At least Taichi asked him for his name. Hopefully they don’t keep portraying Chihaya as a charity case helping out less popular kids have fun in such a insincere manner. Well, I don’t think she was aware of the implications when she called him that. She seems very clueless about society and its conventions, so she might be completely unaware that that’s a mean-spirited nickname. 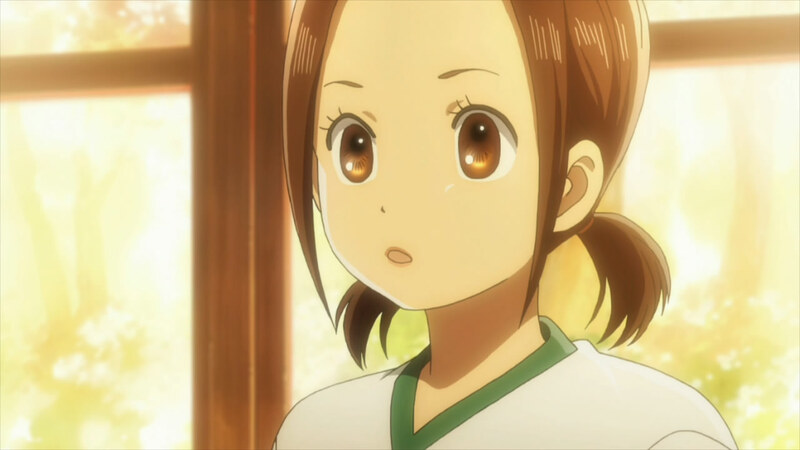 It feels like all she thinks about is karuta and getting her club running. I wouldn’t be surprised if it became his affectionate nickname in the club. I have no doubt it was not meant to be ill-natured. I get the impression that she forgot about the her original feelings and priorities. 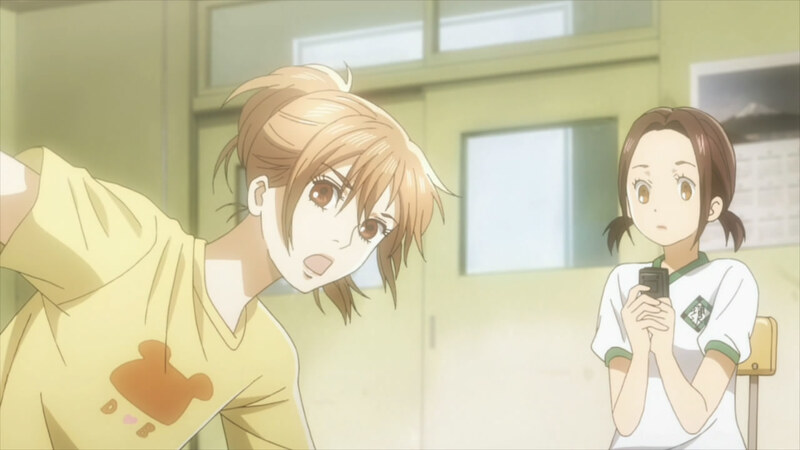 Making friends and having fun through Karuta has ironically somehow turned into Karuta getting prioritized over the spirit of friendship. Seems kind of silly over a card game. Hmmm but I feel like it’s a very intellectual game, one that requires a very specific type of person to enjoy it. That’s why she’s looking for smart people. In some ways it was a fluke for her to like it, since she isn’t really that smart. Then once they have the club together, and they’re playing together, I think that’s when they’ll become friends. And like she said, it’s not like they’re looking specifically for people already good at the game, so she’s definitely willing to find interesting people over karuta pros. 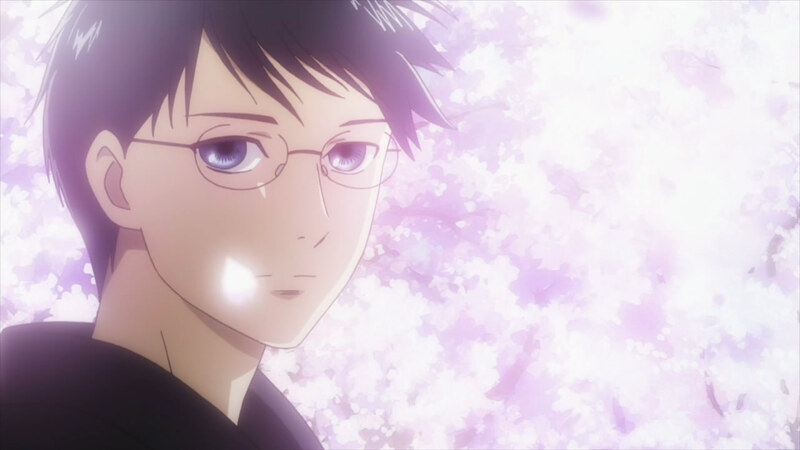 It was your reviews that made me decide to pick up Chihayafuru, so I’d like to say thanks. 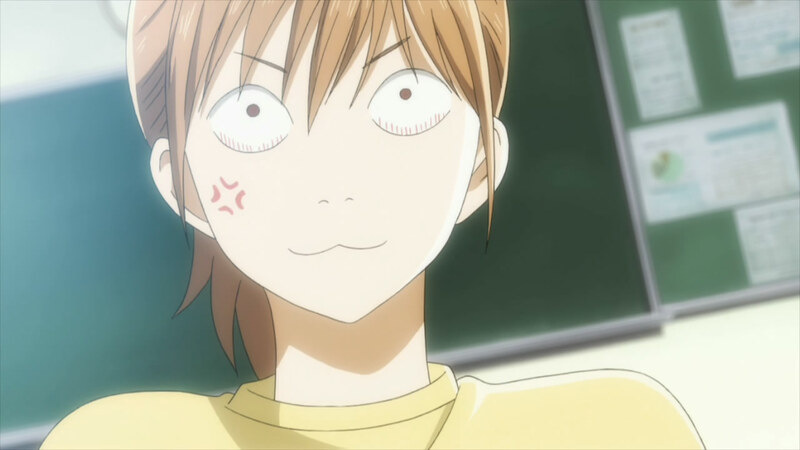 I have to disagree with Chihaya being a dime a dozen – she’s everything most anime females could be, but aren’t. So many girls fall into the ‘bright, responsible foil to main male character’s maverick awesomeness’ category in anime, it gets tiring. 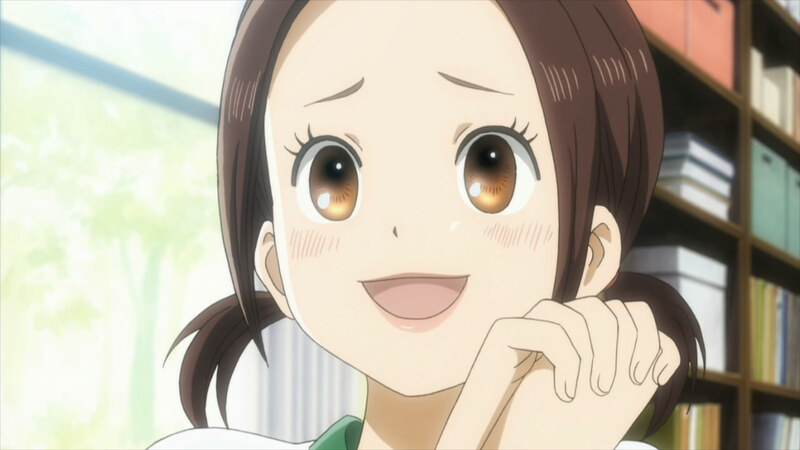 Here’s a female character who’s far from perfect, but, most importantly for the underdog of anime, clearly has recognisable potential in her field of interest. And not just potential to do OK, as female characters tend to do, but excel. Sure, she’s not amazingly analytical, but that’s often the handicap that many main characters have to overcome in anime, and it’s not like it would be impossible for her to get better. You can tell she’s not a character who is going to get left behind as the male characters become more and more awesome. I’ve watched too many promising female characters get sidelined and end up vaguely hanging around in the background, happy just to watch the guys have all the fun. And here is a show where they can actually compete, on a more-or-less equal footing. Also, she’s not obsessed with romance – even if it happens it will be with organic growth, and without her having obsessed over it in a patronising manner. I rather like the focus on her interest, and friendships instead. I think we can see why she relies so much on karuta to make friends, her deep-seated self-worth issues stemming from her family’s obsession with her sister. Look at her flashbacks: she literally lived for her bratty sister’s career, and neither her family nor friends paid any attention to her or anything she did, focusing much more on her connection to her sister. Perhaps to Chihaya, someone who nobody’s ever been interested in for Chihaya’s sake, people need a reason to be friends with you? 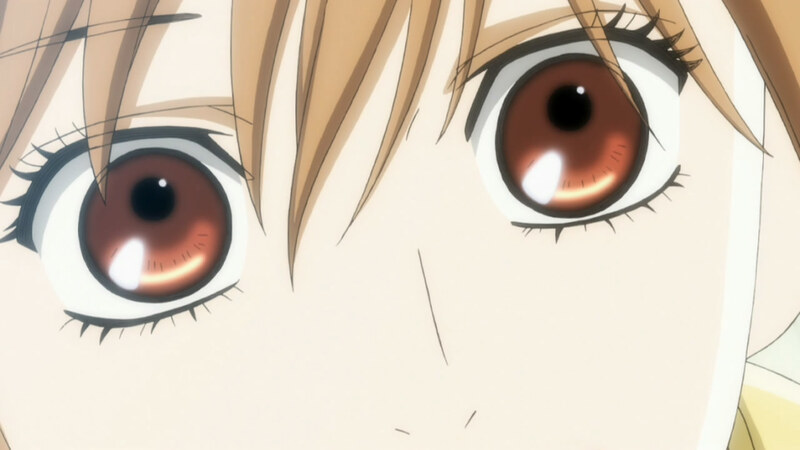 And she feels that for her, that reason is karuta – something she, not her sister, does. We can also relate to her yearning for old times, and old friends, wanting to relive the only times she’s been in any way valued for being herself. Thanks, Minnako – just FTR, that “dime a dozen” comment isn’t from my post. I don’t think that applies to Chihaya at all. And I wouldn’t worry too much about her getting left behind. I think there’s a kind of gender reversal among the leads here, and Chihaya is playing the role traditionally reserved for the male lead.